Framed Image opened its doors on June 6, 1995 and has been serving the tri-state area with caring customer service and award winning framing ever since. Owner Robert Bottge has been in the art and framing industry for over 30 years. Starting out in Koenig Art Emporium in Willowbrook Mall, Robert was taught the framing trade by the owner and an employee. He furthered his skills through trade show seminars, books on framing, and trade magazines. A graduate of Montclair University, Robert was a fine art major, earning his Bachelor of Arts degree. After learning all he could at Koenig, Robert went to work for Shannon Art Gallery, where he began framing and selling more expensive artwork. "I was in charge of framing LeRoy Neiman originals, some valued at over $250,000. It was an amazing experience", says Robert. With his passion for the art and framing industry and his drive to go out on his own, Robert opened Framed Image, an art gallery and frame shop. "Our goal is to provide our customers with the most amazing and caring customer service they have ever experienced. Our frame designs are award winning and are based on each customer's individual style and taste. We frame everything from posters, to original paintings, to priceless children's art". 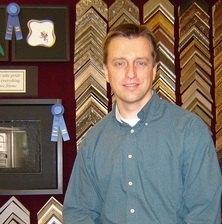 A member of the Professional Picture Framers Association and past president of the New Jersey Chapter, Robert teaches classes on framing, design and marketing to other framers as well as art schools and local organizations. Please browse through our web site and see all that Framed Image has to make your home and office uniquely yours.